Start a summer project by reading “Look Up! 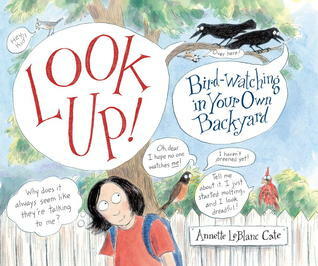 Bird-Watching in Your Own Backyard” (Candlewick 2013) by Annette LeBlanc Cate. Bird watching might not be just a summer-long project but a lifelong project, and can be done right in your backyard. The author points out that birds are the easiest of wild animals to observe. The author/illustrator has drawn identifiable birds—with attitude. Hawks, robins, sparrows and all kinds of birds frequently speak in dialog bubbles, usually giving information about themselves. The various chapters show the new bird-watcher how to identify birds by color and shape—not just standing still but in flight. It might make you realize how much you already know, but most definitely what you could know. The author asks you to draw the bird despite your sketching ability because this will make you a better observer. The finished drawing doesn’t matter as much as what you’ve observed. She asks: does the shape of the body, particularly the wings, have anything to do with the way a bird flies. Does this kind of bird fly straight, swoopy (undulating), or erratically. Is the bird “short-legged and long-necked” like a swan? “Round and plump” like a grouse? Have “a scoopy shovel” of a bill like a duck? Or a “tearing hook” like a vulture? What do these shapes have to do with their behavior? Their way of eating? If you get to know the birds in your backyard really well, you’ll notice differences of other birds father afield, more readily. Observe their behavior. You’ll find sparrows are social and want to be with other sparrows. Hawks are usually solitary or might hunt with a mate. What about the sounds of birds? Their physical presence (swooping birds of prey, hammering of a woodpecker)? Is their call harsh or musical? Does the call seem to say something to you (chick-a-dee-dee-dee)? These are all identifying characteristics. The thousands of individual illustrations that make up a page are both cartoony and accurate—and both kid and adult-friendly. The author gives tips on how to draw birds, such as go for the shape first. Start with birds that might be still for periods of time. I’m a backyard bird watcher and this book gave me a load of tips to better observe. It ends with a bibliography (including examples of the best field guides) and an index. Read it for fun! Just thought I’d tell you that I ordered this book, based upon your review. My 14-year-old son & I have both enjoyed reading it.